Setting: music goes on in a public square with several people talking. One person is calling people attention to the poor. Another person comes takes him down and starts to talk about liberty and individual rights over social commitments. He stands in a box and bashes the poor. No one speaks back and everybody ends up believing in him. He continues to talk while the Call to Worship goes on. One: May God be with you! One: Speak up brothers and sisters! All: We are here to declare that God is our maker, our Redeemer and our rock! All: We are here as Christians, to proclaim the gospel of Jesus Christ, the gospel of salvation, the gospel of transformation, the gospel of liberation and life for all. All: We are here to say no to injustice! We are here to join those who are fighting for the common good, for the right for all to have food, shelter, health and dignity and not only for some of us. All: Due to our commitment to the God of our lives, we will speak up and press those who own political positions to be accountable for their actions in favor of all of the people and not only some! All: The gospel calls us to live together and we are gathering here to counter the discourse and actions of those who stand in the public square, town hall meetings, political parties, government offices and church buildings preaching about private life, private faith and private government. We will stand with those who work for the common good. We will fight with and for the poor. Our faith is a common faith! We will not preach prosperity for ourselves if prosperity does not mean prosperity for all. We are all sons and daughters of God. All: In the name of Jesus, we will! 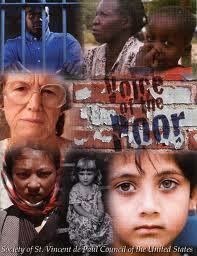 One: Speak up brothers and sisters for the rights of all who are destitute. All: We will defend the rights of the poor and needy. One: When will we speak up? All: Always! Like our prayers, without ceasing. Together we won’t fear the struggle! The Holy Spirit will guide our feet! One: God is here brothers and sisters! All: Let us all give thanks to God! One: May the world sing praises to God our creator! One: May we all sing praises to God our liberator, our rock and our salvation! Sing: Alle-alle-alle-luia! Alle-alle-alle-luia! Alle-alle-alle-luia! Alleluia! Alleluia! One: We have forgot that there is a struggle out there and we have turn ourselves into our own needs forgetting the hurt and pain of others. One: We have forgotten that our faith is a call to preach the gospel and serve the world. We have got used to our comfort and forgot the least of these. One: We are seeing those defining the world for their own good and we are not fighting back. In front of our very eyes, public and common good are becoming private resources and we haven’t said anything. One: Merciful God, act in us, transform us again and makes us instruments of your peace, of your glory, of your salvation. He ascended into heaven, and sits at the right hand of God the Father Almighty. From there he shall come to judge the quick and the dead. I believe in the holy catholic church, the communion of saints, the forgiveness of sins, the resurrection of the body, and the life everlasting. Amen. All: It is right for us to give thanks. This table is God speaking up in the life, death and resurrection of Jesus Christ. This table tells us about God’s commitment to our well being, to a world of justice where every human being is treated with fairness and dignity. This is God’s table and it is God who invites us to partake in God’s gifts to us. However, we know well that this table is broken not only because the broken body of Christ but because we have broken our communion among ourselves. Around this table, we are a diverse, plural, multi-denominational body of Christ and each one of us have different ways to understand, participate and act around this table. But tonight brothers and sisters, we ask each one of you to accept this invitation and participate in this table even if things are not done according to your official rites. Let us use this time to approach each other and heal our brokenness. Tonight, may this table be a sign of our healing. Please come to the table and take part of it. This table belongs to God. So, if you feel called, let us partake together around these gifts that God has prepared for us. At this table we are called to be grateful and to lift up our hearts in thanksgiving. For God has manifested God’s love since the beginning of the world. In Adam and Even, God formed us in God’s image. In Abraham and Sara God sent us in a journey. With Noah, God called us to trust. With Ana, God made us laugh. With David, God wanted us to have God’s heart. And from the lips of the prophet Jeremiah, God reminded us of how we should consider God’s ways to us: “For surely I know the plans I have for you, says the Lord, plans for your welfare and not for harm, to give you a future with hope.” This table is a sign of an invisible grace, a sign of a future with hope in God. Through Jesus Christ, this table is a table of our life together, of our common welfare. It was Jesus who offered himself to us so we could live and live together! This is not a private table but a table for the whole world! At this table beggars, prostitutes, sinners and even us, are called to participate. At this table we remember ourselves that through Jesus Christ’ life, death and resurrection we must live a common life to all. All: Jesus has died, Jesus is Rise, Jesus will come again. At this table the Holy Spirit speaks to us so we go to the world to speak up! By partaking at this table, we learn that God has spoken on our behalf, to the point of death! At this table we are reminded that Jesus gave himself in love so all of our tears could be wiped away. At this table, we are nourished in order to nourish. At this table we have enough food and drink for all! The Holy Spirit is hovering around us so we can become God’s voice to the world. The Holy Spirit sends us from this table into the world to transform the world and speak up for the least of these! In Jesus name, we will speak/act on behalf of the weak so they their tears can also be wiped away. At this table God remind us that we were nobody and now we are somebody! From this table we go out, speaking up for those who have no voice, those who depend on others to survive, for those brothers and sisters who go hungry and are still feeling they are nobody. Come Holy Spirit! Come and renew your creation! Come and look upon those who are sick, disfranchised, excluded, outcast, hurt and hungry. Oh God have mercy and hear our prayers! Holy Spirit, come and renew ourselves, our commitment with you, with your people and your world. Come and bless this bread, this wine and this people! God in your mercy, hear our prayers. One: Friends these are the gifts of God to the people of God. Prayers of thanksgiving after the Eucharist.